Did you receive a rare Pentagon invitation to travel to Guantanamo Bay for war crimes hearings? If so, are you searching for info on how to prepare for a Guantanamo trip, what to pack, will your U.S. mobile phone work, what about internet access, how is flying on a military plane from Andrews Air Force Base different from flying civilian, do you need your passport, can you meet detainees and see the prisons camps, will you have the resources needed to accomplish your Guantanamo mission / goals? Each new Guantanamo traveler has these and other questions, which are answered in this revised and expanded Know Before You Go to Guantanamo Guide (downloadable below). In 24 Chapters (76 pages, 2 Appendices), the Guide speaks directly to non-governmental organization (NGO) observers, who play a specific, valuable role at Guantanamo Bay. The Guide anticipates new observers’ concerns, and addresses them methodically and comprehensively, and helps observers prepare for their missions. The Guide may be helpful for anyone traveling to Guantanamo hearings, including media, court staff, witnesses, foreign government representatives, etc. The Guide notes that monitors (also to as “non-governmental organization observers” or “NGO observers”) have the responsibility to attend, observe, analyze, review and critique Guantanamo Bay Military Commission (war crimes) hearings. This requires substantive preparation before traveling to Guantanamo, full schedules on the ground there, and follow-up upon return to the U.S. Monitors (and others) must eat, sleep and exercise at Guantanamo and the Guide informs about that, and about Guantanamo tourist attractions, souvenirs, and entertainment such as outdoor movies. The Pentagon has been permitting NGO observers to travel to Guantanamo Bay, Cuba to monitor cases against men charged with heinous crimes concerning the 9/11 World Trade Center and Pentagon attack, the 2000 bombing of the U.S.S. Cole off the coast of Yemen, and other incidents. The monitors, who must be U.S. citizens, include representatives of human rights groups, lawyers, judges, law professors and law students, and the non-legal community members. The Pentagon has stated that it invites monitors to promote transparency — for monitors to be the eyes and ears into Guantanamo to the outside world. Monitors attend, observe, analyze, critique and report on the substance of the war crimes hearings themselves and on the process involved in the proceedings. Monitors assess how transparent the proceedings are, and examine whether the monitors are given the access to the personnel, proceedings, resources they need to perform their assigned tasks. Monitors tend to travel for one week at a time, departing the U.S. on a weekend and returning the following weekend, with hearing days scheduled Monday – Friday of that week. We hope that the Know Before You Go to Guantanamo Bay Guide is helpful to you as you prepare for your mission! PS: If you have any comments / suggestions / tips to be included in the next iteration of the Guide, please let us know in a comment below. Or, please send an e-mail to us at GitmoObserver@yahoo.com. 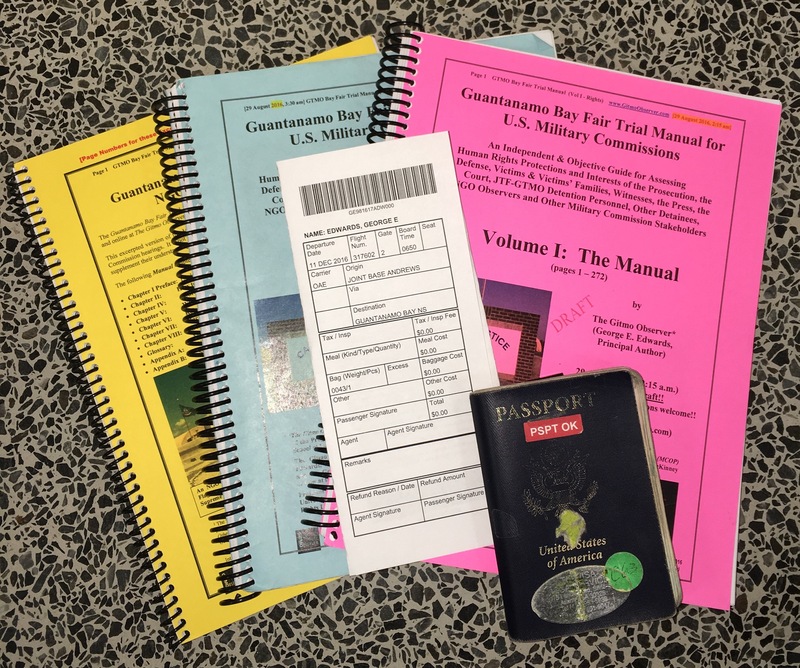 My Guantanamo Bay flight boarding passport and passport, and my Guantanamo Bay Fair Trial Manuals. 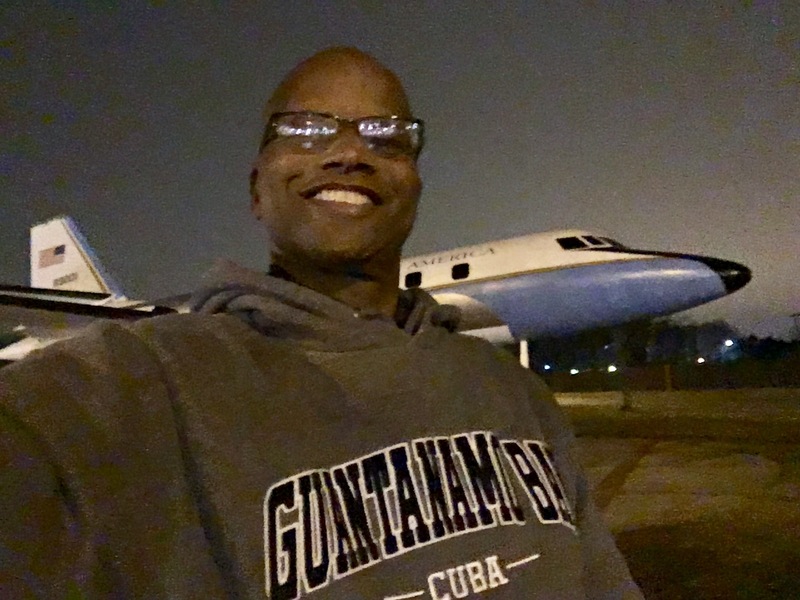 It’s 3:59 a.m. and I just arrived at Andrews Air Force Base for my 5th or 6th trip to Cuba since the 2016 summer, and my second trip to Guantanamo Bay since the November Presidential Election. 4:15 a.m. Sunday at Andrews Air Force Base. This time I’m monitoring hearings in the US Military Commission against al Nashiri, who allegedly masterminded the 2000 attack on the USS Cole off the coast of Yemen, killing and wounding dozens of US sailors. He is charged with a series of war crimes and faces the death penalty. My job as a human rights law monitor (or observer) is to attend, observe, analyze, critique and report on these pre-trial hearings. We are interested in whether the rights and interests of all military commmission shareholders are being afforded to them. “Stakeholders” include the defendants, and also include the victims and their families, the media, the prosecution, witnesses, the US and international communities, among others. This should be an interesting week. We have 5 days of pre-trial hearings scheduled. The issues are plentiful, with some being novel. As I’m sitting here at Andrews, I’m observing al Nashiri’s lawyers enter the terminal, members of the prosecution team, human rights group (NGO) representatives, IT staff, trial judiciary staff, and others, all waiting for our 8:00 a.m. flight. Why arrive at 4:00 a.m. for an 8:00 a.m. flight? Well, because we were instructed to do so. That’s it. 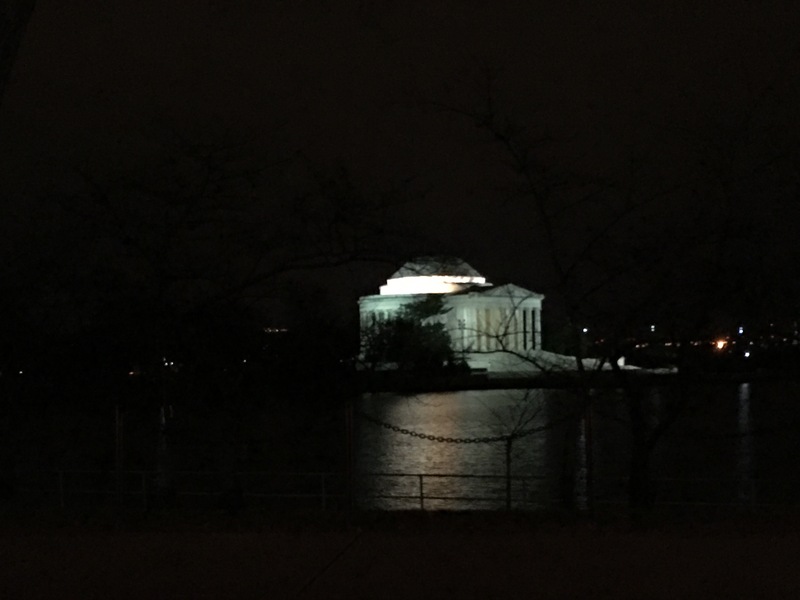 Jefferson Memorial–3:45 a.m.–while driving to Andrews Air Force base. al Ansi in a Department of Defense photo. Today, after 14 years imprisonment at Guantanamo Bay, Cuba, a Yemeni detainee named Mohammad Ahmad Abdallah al Ansi asked the U.S. Government to transfer him from Cuba to a third country. If released, 58 detainees would remain at Guantanamo, down from a record high of 780 detainees. This parole board like hearing is called a Periodic Review Board (PRB), and was convened pursuant to President Obama’s 2011 Executive Order calling for PRBs to ascertain whether detainees pose a continuing threat to the national security of the U.S. If a detainee does not pose such a threat, he may be repatriated to his home country or transferred to a third country. It is unknown whether the next President will rescind this Executive Order and cease Period Reviews, and whether any of the 5 dozen remaining detainees will be released after January 2017. President Obama’s 2011 Executive Order calls for three types of PRBs: (a) an Initial PRB for all detainees, involving a hearing at which the detainee may appear and speak on his own behalf; (b) a file PRB, held 6 months after a detainee is denied release following an initial PRB and which detainees are prohibited from attending; and (c) a full PRB, held if after a file review the Board finds that the detainee is a “continuing” risk to US national security. Al Ansi, who is also known as prisoner number YM – 029, had his initial PRB in February 2016, a file PRB in September 2016, and a full PRB today. This article discusses the initial, file and full reviews. In making this determination, the Board considered the significant derogatory information regarding the detainee’s past activities in Afghanistan. Further, the Board noted the detainee’s lack of candor resulting in an inability to assess the detainee’s credibility and therefore his future intentions. The Board looks forward to reviewing the detainee’s file in six months and encourages the detainee to continue to be compliant, continue taking advantage of educational opportunities and continue working with the doctors to maintain his health. The Board encourages the detainee to be increasingly forthcoming in communications with the Board. On 14 September 2016, the PRB conducted a file review for Muhammad Ahmad Abdalla al­ Ansi (YM-029) in accordance with Executive Order (E.O.) 13567, “Periodic Review of Individuals detained at Guantanamo Bay Naval Station Pursuant to the Authorization for Use of Military Force.” The PRB previously conducted a full review of the detainee and on 23 March 2016 determined that continued detention was necessary to protect against a continuing significant threat to the security of the United States. After reviewing relevant new information related to the detainee as well as information considered during the full review, the Board, by consensus, determined that a significant question is raised as to whether the detainee’s continued detention is warranted and therefore an additional full review should be conducted in accordance with section 3(c) of E.0. 13567. I watched al Ansi’s PRB broadcast live from Guantanamo Bay into a nondescript Pentagon conference room this morning, with a handful of human rights advocates and one member of the media. Today’s PRB (6 December 2016) as Ansi had a “full” PRB review. Today’s full PRB, like all the other PRBs, was held at Guantanamo Bay. Today’s session was broadcast by live close circuit TV (CCTV) to a secure location at the Pentagon for viewing by non-governmental organizations and the media. I observed the hearing in a modest Pentagon conference room, joined by representatives of non-governmental organizations (Judicial Watch, Heritage Foundation, ACLU, and Human Rights First) and the media (Courthouse News). When we watched these proceedings piped in from Guantanamo, we also had 2 to 3 military or civilian escorts or technicians in the room with us, but I will not reveal further information about the identities, ranks or affiliations of these individuals (all of whom are always very friendly and nice!). Members of the PRB Board – which comprises one representative each from the Departments of Homeland Security, State, Justice and Defense; the Joint Chiefs of Staff; and the Office of the Director of National Security – were not physically at Guantanamo Bay, but watched the proceedings from the D.C. area, presumably from their respective offices. It is unclear when the Board is expected to make a final determination on this full PRB, and whether that determination will be made before the Obama Administration ends on 20 January 2017. Some of the words spoken during the hearing were in Arabic, and were spoken by an on-camera interpreter. 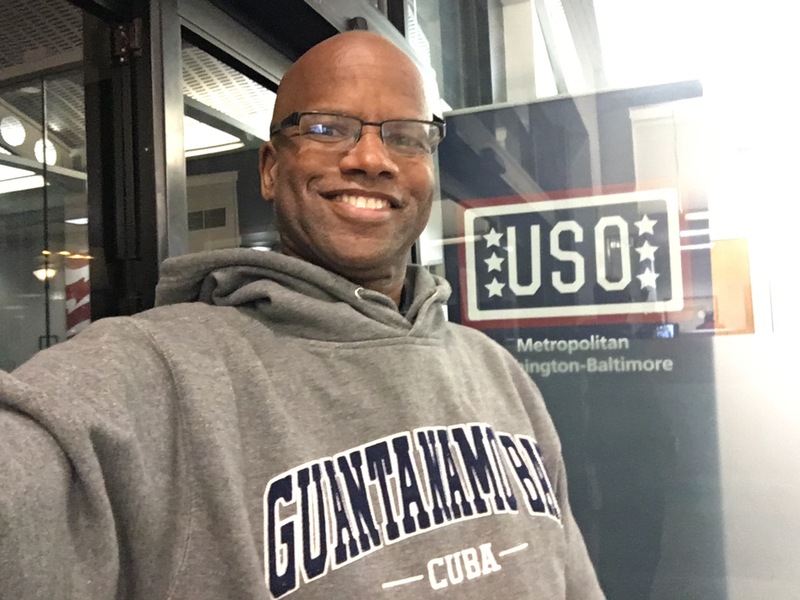 Another off camera voice read aloud the government’s “unclassified summary statement”, in English, of behavior that al Ansi allegedly engaged in, both before he arrived at Guantanamo and after he arrived. After the government’s unclassified summary statement, the personal representative read an opening statement in English. Then, al Ansi’s private counsel read a statement, also in English. After the statements, an off camera voice asked if anyone had any questions. There were none. The unclassified portion of hearing ended roughly 15 minutes after it started. Observers were invited to leave the conference room, since Observers are not permitted to observe classified portions of the PRB hearings. Who is Mohammad Ahmad Abdallah al Ansi? He is 40 or 41 years of age, born in Yemen. The government paints a picture of him as an avowed war criminal member of al Qaeda, as being loyal to Osama bin Laden, and as a person slated for an aborted hijacking in Asia meant to coincide with 9/11. The government has kept al Ansi in prison at Guantanamo Bay for over 14 years, and has on multiple occasions affirmatively ruled that he posed a threat to the national security of the U.S. Indeed, this same PRB ruled twice this year (February and September 2016) that al Ansi should not be released. al Ansi’s personal representative and private counsel painted a different picture of al Ansi. The private counsel spoke about al Ansi’s suitability for release, and what he might do constructively upon release. Though the personal representative did not directly speak to the issue of whether he thought al Ansi posed a continuing threat to U.S. national security, the personal representative did not speak against release. Today’s full PRB hearing commenced about 9:06 and ended 15 minutes later at about 9:21.
al Ansi sat at the head of a small white rectangular table that appeared to be in a Guantanamo Bay “trailer” (and not in a Guantanamo Bay courtroom). On the long side of the table to his left sat his personal representative in a U.S. military uniform. Directly across from him, to al Ansi right, sat the linguist. Next to the linguist was the private counsel, sitting closest to the camera. Throughout much of the hearing, al Ansi, who was dressed in white non-descript attire, sat with his elbows resting on the table, hunched a little forward, flipping through documents in front of him, possibly reading through the documents. It was impossible for us to see on the screen what the nature was of the pages in front of al Ansi, or in what language the pages were written. At times he would rest his forearms on the table, with his hand clasped, eyes cast downward. al-Ansi’s was represented at this PRB by private counsel Beth Jacob who is a partner at the New York law firm Kelley Drye & Warren, where she represents generic pharmaceutical companies. Before she joined Kelley Drye & Warren, she represented the Port Authority of New York & New Jersey in litigation arising out of the 9/11 attacks, representing 9/11 victims who sought compensation. She had previously been an assistant district attorney i n New York, prosecuting fraud and official corruption. She only began representing al Ansi since after his initial PRB ruling finding that he continued to pose a threat to national security of the United States. She pointed out that al Ansi showed her some of the artwork created at Guantanamo Bay, and she showed it to a New York-based artist, who “was struck by his ability and innate talent , as she has written in her letter to this Board”. In support of her arguments supporting al Ansi’s transfer, his private counsel argued that his: “family still has resources which they are completely willing to use to help their brother start a new life after Guantanamo , as shown by the statements the family submitted to the first board and this panel. His family will be a stabilizing force when he is transferred. The second factor [supporting transfer] is his health. [Redacted] [Redacted] [Redacted] [Redacted] He knows that managing these chronic conditions takes much time, effort and attention, and that he must follow a strict diet and exercise regimen , in addition to his medications. She argued that if released, he will also have support of the Carter Center, founded by President Carter, and Reprieve’s Life After Guantanamo project, which has helped over three dozen former detainees. al-Ansi has intensely participated in the PRB process”, has “maintained a record of perfect attendance for meetings with his Personal Representative (PR) and Private Counsel (PC) despite the constant change in schedulling”, and that his “professional manner throughout all engagements with his PC and PR has not wavered. He continues to enthusiastically maintain his compliant behavior with the Joint Task Force (JTF) Guard Force and continues to engage with the JTF Medical Staff in order to deal with chronic health issues. In addition, Mr. Al-Ansi has not ceased to passionately take advantage of the educational opportunities to include courses in Mathematics , Science, English, Spanish, Life Skills, Computers, Art, and recently started the Arab British Academy for higher education studies. Since July of 2016, he has created an additional 150 quality works of art. Seven additional works of art are included in his case submission. Recently, he has enrolled i n Small Project Management , Business Administration, Accounting and Ledgers classes. Unlike other personal representatives in other cases, this Personal Representative did not say whether or not he believed that al Ansi is or is not a threat to the security of the United States”.